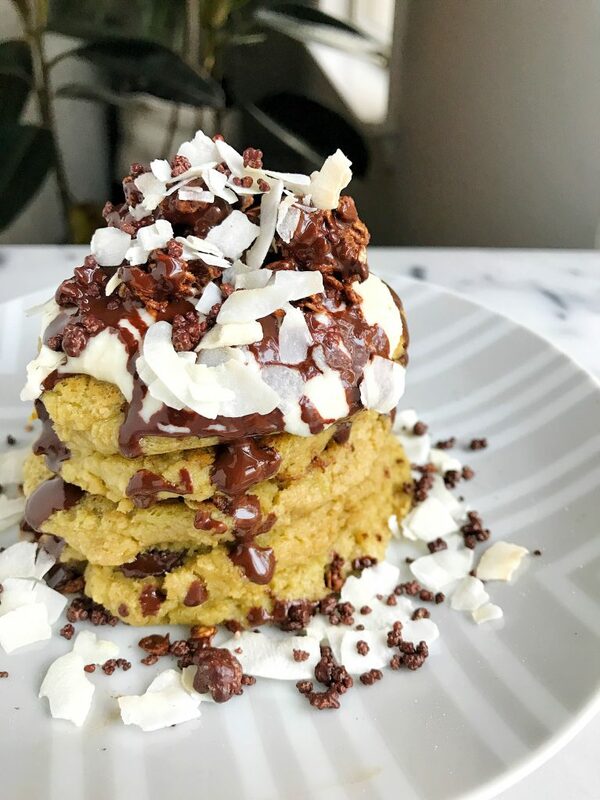 Healthy Chocolate Chip Avocado Pancakes that are vegan, gluten-free and a great low sugar stack! AVOCADO PANCAKES. Pancakes clearly have no limits anymore friends. You are likely reading this and shaking your head that we are making pancakes made with avocados in them, but just hear me out. These pancakes may be green and have avocado in them. And yes it may be kind of weird eating a stack of green pancakes for breakfast, but they do not taste green or savory or anything like that. 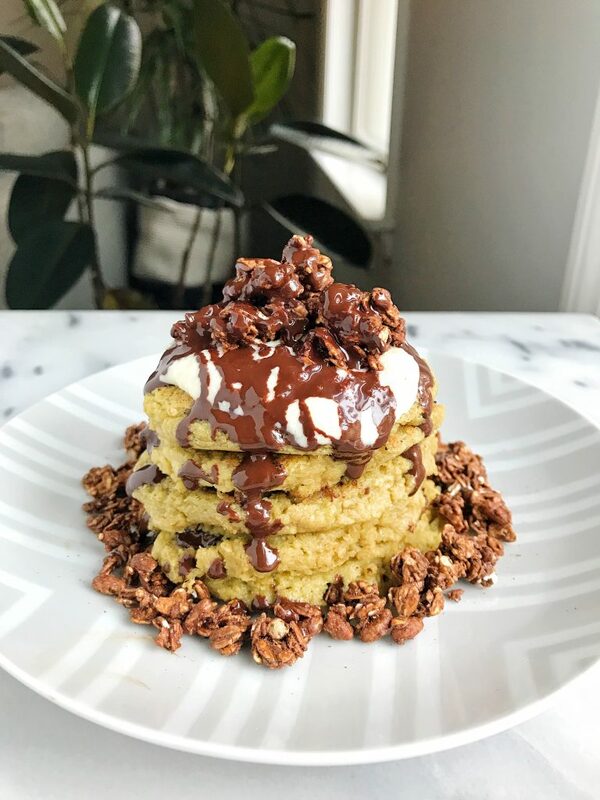 They remind me of making vegan banana pancakes and they are a healthy stack of cakes that are waiting to be topped with your favorite coconut yogurt and chocolate sauce. I love that these pancakes are entirely plant-based and made with just a few ingredients. No, they are not like your traditional pancakes and they do need to be flipping a bit more gently than a stack of Bisquick. These Chocolate Chip Avocado Pancakes are also made with oat flour and not your traditional flour. I also don’t use any nuts or nut flour in this recipe making it nut-free! Instead I made oat flour from One Degree Organics Sprouted Rolled Oats. We spoke about my love for One Degree Organic’s oats in my Vegan Cinnamon Coffee Cake Loaf and their sprouted spelt flour in the Chocolate Dipped Peanut Butter Cookies. I am seriously obsessed with their products you guys. And even my brother and dad are now on board. I brought them a handful of tortillas and breads from One Degree Organics and they cannot get enough! What I love most about these pancakes is how minimal the ingredients are. 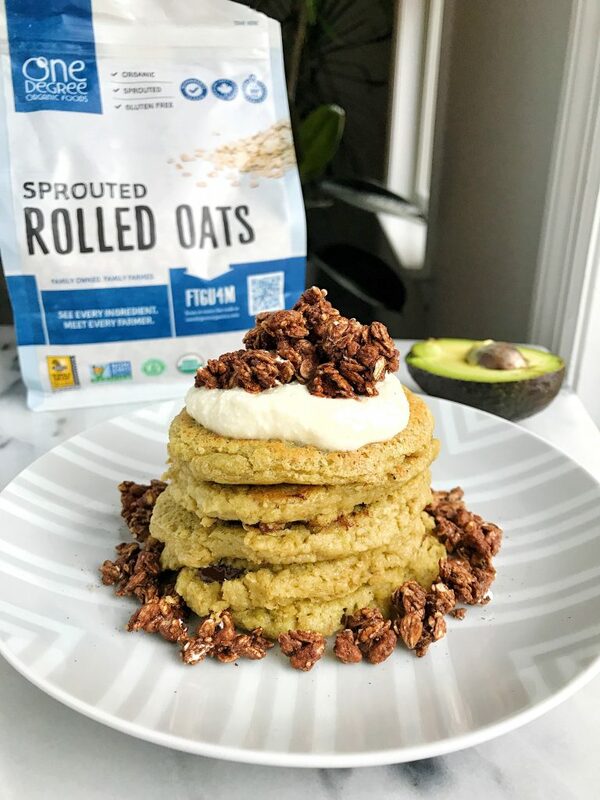 You just need to quickly make oat flour of of the sprouted rolled oats, which takes a couple of minutes. Simply add the oats to the blender or food processor and pulse until it is in a fine flour-like form. But why avocado? Why am I using avocado for something sweet instead of guacamole or avocado toast? Well friends, I want to give us plenty of recipe options. Recipes that are moderate in sugar and recipes that are lower in sugar like this one. Adding avocado to this stack instead of banana cuts the sugar content for us. You can absolutely add some extra maple syrup or sweetener if you prefer, but I think these taste amazing as is. Especially with some chocolate sauce and some of One Degree Organic’s granola on top! I hope you love them as much as I do. Don’t forget to post about them on social media if you make them and join the rachLeats tribe on Facebook if you want! We are chatting all things food, wellness and more DAILY! Remove from heat once cooked and enjoy with your favorite toppings! Thank you One Degree Organic Foods for sponsoring this post. It means so much to me to work with brands that I love and who support rachLmansfield! Hi Rachel! Regarding oat flour, am I highly obligated to use one degree organic oat flour or can I choose any kind of brand? Please let me know! any works! i just love one degree because it is sprouted and easier to digest 🙂 but use anything that works! Any recommendations on what to sub for the oat flour to make it paleo? i haven’t tested any other flours (i used one degree organics as this was created for them!). feel free to try almond? not sure how it will be, keep me posted! I just made this recipe but when I was finished the batter seemed a little thick but I cooked them anyway. Looking back at the recipe I feel like I missed a step. When do we add the coconut milk and chia egg? Wasn’t sure if I somehow misread a step but I forgot to add those in! Thank you – they still turned out yummy! Can this recipe be used to make waffles? Or will it be too thick? i’m not sure! if you try it, maybe add some coconut oil to batter? you may need to mess around a bit 🙂 keep me posted! !